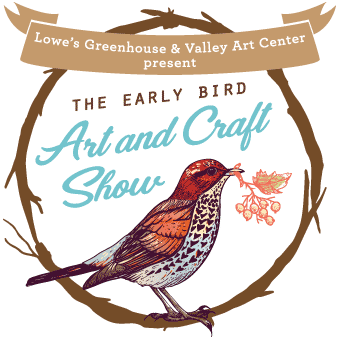 Valley Art Center and Lowe's Greenhouse are proud to present the third Early Bird Art and Craft Show. The one-day show and sale will feature approximately 30 fine artists and crafters in the beautiful setting of Lowe's Greenhouse's inspiring and spacious facility. Each artist will be provided a table and chairs to set up a booth to sell their artwork. Awards include the 'Juror's Choice' and 'People's Choice' Awards. The show will be promoted by Valley Art Center and Lowe's Greenhouse. All contact information must be completed in order for your application to be reviewed. Three images that are representative of the work you will be displaying and selling should be submitted. Submission is completed upon payment of a non-refundable $10 submission fee. The submission fee is made via PayPal through EntryThingy, our online submission process. Following notification of your acceptance to The Early Bird Art and Craft Show, your booth fee will be due by February 24th, check, cash or credit card payable to "Valley Art Center," 155 Bell Street, Chagrin Falls, OH 44022, 440-247-7507. Do not send booth fee until you receive notification of acceptance. Booth fee is $25 for accepted exhibitors. Box lunches will be available to order for an additional low cost. No refunds will be made after booth fee is submitted. Title your digital files with your last name_first name initial_number then title of piece. Example: Jones_A_2.Twilight Impressions. Images should be no larger than 1920 pixels horizontal x 1920 pixels vertical. Image files should be no larger than 1.8Mb. Baseline JPG format (do not use Progressive JPG format). If you are accepted, artwork displayed at the festival must be consistent with your submitted images. VAC cannot provide detailed instruction on creating image files for entry as rendering digital images depends upon a multitude of factors specific to your technology. If you have any general questions call VAC at 440-247-7507. 1. All work MUST be original and for sale. 2. All work must be designed and executed by the accepted artist. Artwork must reflect the work depicted in application images. 3. Artists may only show work in categories approved by the jury. All work exhibited must be of the quality and type shown in the images submitted to the jury. More than one category may be exhibited but each category of work to be shown must be submitted separately for jurying. EntryThingy will allow artists to submit up to three applications at $10 per application. To exhibit work in more than one category, an artist must submit 3 images for each category of work and indicate if they will exhibit if only one area is accepted. Application forms and fees must be submitted separately for each category. 4. Works created from kits or assembled from machine manufactured items are not acceptable. 5. Artists MUST remain with their work during sale hours. 6. Artists must provide all display equipment to fit in a 6' x 6' display. 2 chairs and 1 table will be provided. No electricity is available for artists. 7. Artists are responsible for proper insurance and protection of self, work and set up. The Valley Art Center and Lowe's will not be responsible for damage to work or set up due to weather or unrelated incidents. Valley Art Center and Lowe's will not be responsible for loss or physical injury to vendors, vendors' property and/or guests. 8. Once the artist has unloaded their display materials, they will be directed to a designated parking area at Lowe's. 9. All Vendors are required to have a vendor's license according to the state of Ohio. A vendor's license can be obtained at the Ohio's Department of Taxation website.